Now substantially updated with a groundbreaking new introduction on telomeres, bioidentical hormones, and more, Drs. Oz and Roizen—the bestselling coauthors of the blockbuster YOU series—present a new edition of their #1 New York Times bestselling indispensable guide to maintaining vibrant health, improving longevity, and aging gracefully. Most people think that by age forty-five, every aspect of our bodies is bound to decline. But the wear and tear associated with aging is not inevitable. In fact, the biological processes that age you can be reprogrammed to work the same way they did when you were younger. In this revised edition of the bestselling classic, Drs. Oz and Roizen show you how to beat the seemingly inevitable aging process. With their entertaining style and signature insight, Dr. Oz and Roizen share a new introduction on telomeres, the nucleotide sequences that cap your chromosomes and may the hold the key to determining your lifespan. There are steps we can take to protect and lengthen these sequences, and YOU: Staying Young explains what to do. 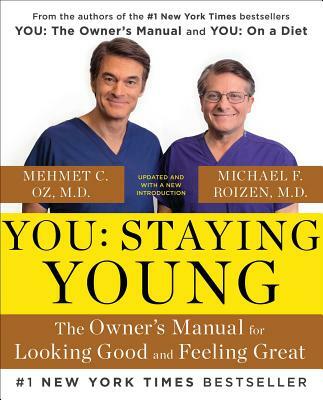 Grounded in the latest scientific research and filled with illustrations, Dr. Oz and Roizen’s fourteen-day plan for staying young will help readers boost vitality, increase energy, and improve vitality…and age beautifully. Because living longer isn’t about dodging disease, but about sustaining a high quality of life for years to come. Michael F. Roizen, MD, is the four-time #1 New York Times bestselling author and co-founder and originator of the popular RealAge.com website. He is Chief Wellness Officer and chair of the Wellness Institute of the Cleveland Clinic and Chief Medical Consultant to The Dr. Oz Show. He currently lives in Shaker Heights, Ohio. Mehmet Oz, MD, is a cardiothoracic surgeon. He has won nine Daytime Emmy Awards for The Dr. Oz Show. A professor of surgery at Columbia University, he directs the Complementary Medicine Program at New York—Presbyterian Hospital and performs more than fifty heart operations a year. Dr. Oz has written eight New York Times bestselling books, including Food Can Fix It, YOU: The Owner’s Manual, YOU: The Smart Patient, YOU: On a Diet, YOU: Staying Young, and the award-winning Healing from the Heart.